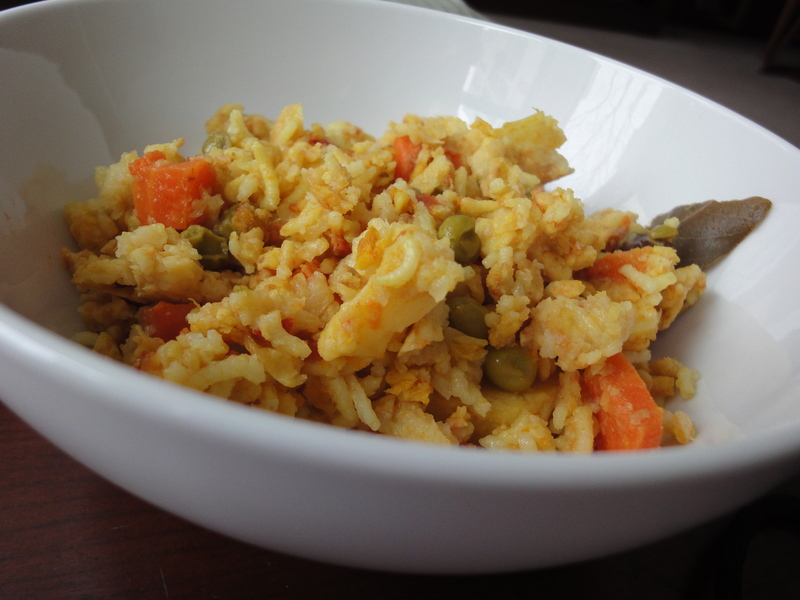 Khichri, a dry (khilwa) or moist preparation consisting of rice and lentil in equal parts, is one of my favorite foods. With a pressure cooker, it is an easy one-pot meal to prepare. My simplest khichri is rice and moong dal, with some salt, turmeric, heeng or asafoetida and ghee or clarified butter. I then add any vegetables that I have on hand such as peas, cauliflower, carrot, beans, potatoes, summer squash and pumpkin. As per my mother’s instructions, I initially stir-fry onions, ginger and tomato and also separately dry roast the moong dal. My mother-in-law, on the other hand, only adds whole pieces of ginger and garlic and doesn’t roast her dal. Seasonings can be as varied as whole garam masala (whole bits of cardamom, bay leaf, cinnamon, clove and peppercorn) sizzled in hot ghee in my mother’s version, or just whole cumin in my mother-in-law’s. I am especially attached to khichri, because it was one of the first real meals that I cooked for Agastya when he was a baby. There was something extra-satisfying about a novice-cooked meal that my infant would eat. “He doesn’t know any better,” I would reason, and waited for the day that he would find out his mother really couldn’t cook. As he grew older, I began layering in more spices, different vegetables and sometimes even an additional lentil such as whole green moong into his little pot of khichri. Agastya happily continued to eat the concoction that I put before him. My khichri has now acquired a comforting and regular presence on our dinner table. I often make a big steaming mild pot so that the three of us can eat it together. My husband, who was raised on spicy Andhra cooking, eats his with raw red onions and spicy pickle, while I enjoy my khichri with sugar-sweetened yogurt. Khichdi is one of those few food items that brings up conflicting emotions in me. On one hand it reminds me of the days I had typhoid and could only eat Khichdi and apple stew, and on the other, of glorious fights with Bunny on Friday evenings debating about Saturday lunch- her obsession with khichdi on saturdays never failed to amuse me. At the same over the years, mom experimented and figured out the perfect way to satisfy us both- khilwa khichdi for me and normal (ugh) khichdi for Bunny. So now I love Khilwa Khichdi and don’t mind the other type as well, but my first reaction on hearing the word Khichdi, is as I said above UGH! As a last point-and I hope the great Agustan reads this someday when he is in my shoes with the same hatred for Khichdi- the khichdis you make for him with the plethora of uncoventional vegetables are actually quite tasty!